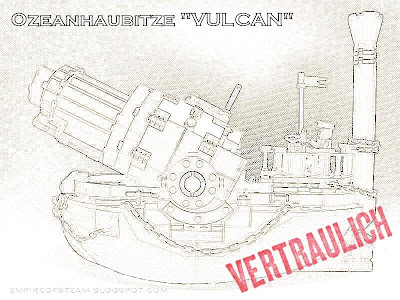 Empire of Steam - A Lego Steampunk Alternate History: Prussian Naval Howitzer: "Vulcan"
The development of the Vulcan-class Naval Howitzer was publicly-ridiculed by Imperial Admiralty commanders. Senior figures expressed their doubts to the Press that it could ever be safely fired without the recoil sinking the vessel, and some voiced opinion that perhaps the Kaiser, or "Little Willie" as they christened him, was attempting to compensate for a personal deficiency elsewhere. In private however, Naval Chiefs were concerned. The Vulcan represented a massive leap forward in Prussian naval engineering for although the vessels were very slow and handled rough seas poorly, their formidable armament could deliver a devastating bombardment. The Vulcan's 48" howitzer could drop Nitroglycerine shells on targets over 18 miles away. This far outstripped the range of even the most powerful Imperial guns. Despite Admiralty fears, the Vulcans never proved to be a serious threat. There were only ever eight Vulcan vessels commisioned. Their numbers were limited partly due to the enormous cost of forging the gun barrels, but mostly because even one firing of the gun deafened the entire crew of the craft, resulting in few sailors being willing to serve on board. Interested readers are invited to view more images of this vessel here.